GSGBC’s Arts Program is committed to helping kids learn about and explore art in their daily lives. 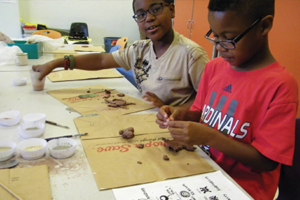 Most of the Arts Program’s activities take place in GSGBC’s Art Room, which is fully stocked with arts and crafts supplies and equipped with a woodshop and a pottery kiln. The Arts Program features projects and lessons designed to appeal to different age groups and activities that are age and skill-level appropriate. Interacting with art can improve motivation, concentration, confidence, and teamwork. In 2013, GSGBC’s Board of Directors made a strategic investment to renovate our Art Room. The renovation has transformed the Art Room into a bright, colorful, and light-filled space for children to get their hands dirty with a variety of art projects and get their minds stimulated by the latest art-based technology. This project is supported in part by an award from the National Endowment for the Arts. ArtWorks. Financial support for this project has been provided by the Missouri Arts Council, a state agency. The Literacy Through Art Program is a vital component of GSGBC’s literacy-rich culture. 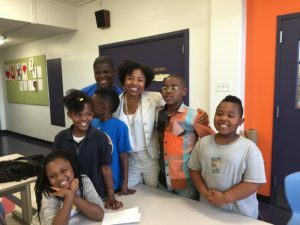 Through the Literacy Through Art Program, youth ages 6-18 create art that focuses on enhancing their love and understanding of reading. GSGBC respects that all youth learn in different ways and that the arts may produce greater academic growth in some youth than a formal classroom setting. GSGBC’s professional art teacher, coordinates the Literacy Through Art Program. GSGBC designs age -appropriate projects and coordinates a variety of professional guest artists who bring their area of expertise to the Club. Members learn a variety of subjects, including painting, drawing, paper making, writing, illustrating, and bookmaking.